We have a teething bub in our house. He loves this portable elephant teether from Nuby. The Play Soft teether has great features like soft and hard surfaces for little mouths to utilize. Plus it has the ability to attach to the car seat or stroller. 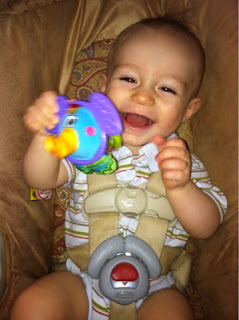 Baby did find out QUICKLY that this teether can be tossed across the room and the van (and that it was hilarious). Other than that, we really like the teether and it's chewable surfaces!